SEOUL, South Korea -- South Korean soldiers fired 20 warning machine gun rounds Thursday, turning back North Korean soldiers apparently pursuing a comrade who had earlier dashed across the rivals' shared border, officials said. It is the fourth time this year a North Korean soldier has defected across the world's most heavily armed border. South Korean military officials said they heard gunfire from the North after South Korea fired its warning shots, but it wasn't clear if the firing was retaliatory. Neither side immediately reported casualties. North Korean soldiers occasionally flee over the land border, but there have been few defections as dramatic as one that happened nearly 40 days ago, when a northern soldier crossed at a different, very public place - a jointly controlled area that is the only place where troops from the rivals face off only feet away from each other. That soldier was shot five times by his former comrades in an escape caught on video. He has been recovering in a hospital. The site of that defection is familiar to many foreign tourists, who can visit the blue huts that straddle the line between the rivals. Thursday's defection happened at a much more remote section of the 2.5 mile-wide, 155-mile-long Demilitarized Zone (DMZ), which serves as the border between the Koreas. When the defecting soldier -- reportedly a 19-year-old -- arrived at a front-line South Korean guard post, there was no shooting from the North, according to South Korea's Joint Chiefs of Staff. Spokesman Roh Jae-cheon said the motive for the defection is under investigation. Later Thursday, however, South Korea's military detected several North Korean soldiers approaching the line between the countries in the DMZ, prompting the South to broadcast a warning and fire 20 warning shots, said a South Korean defense official, requesting anonymity because of department rules. 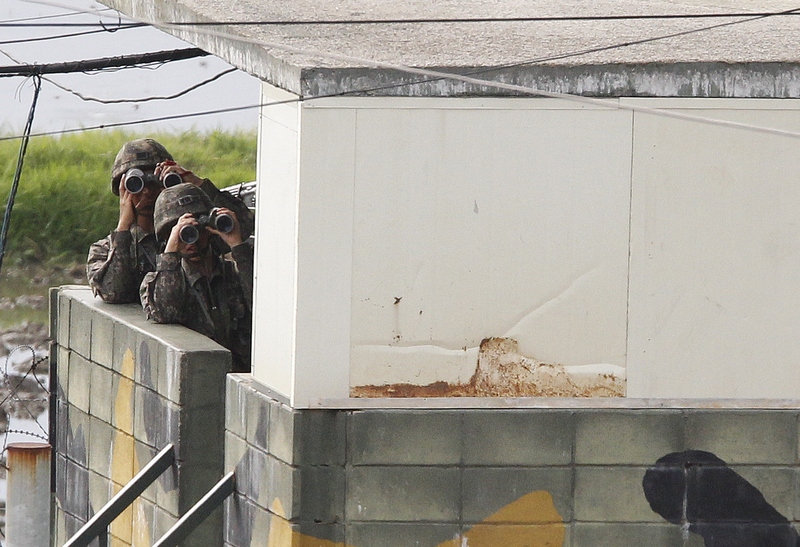 The North Korean soldiers who approached the line were believed to be on a mission to hunt down their defecting comrade. They turned back to the North after the South's warning shots, the official said. About 40 minutes later, soldiers twice heard several rounds of gunshot on the North Korean side of the border. No North Korean bullets were found in the South, the official said. The latest defection was the fourth North Korean soldier to flee through the DMZ this year, the Defense Ministry said. About 30,000 North Koreans have defected to South Korea mostly via China since the end of the 1950-53 Korean War. In a separate incident, two North Korean men found aboard a wooden boat off the east coast on Wednesday asked to resettle in the South, according to Seoul's Unification Ministry.